Your website sources report says a lot about not only your own acquisition strategy but also changes in the marketplace that render tools and channels more (or less) effective. 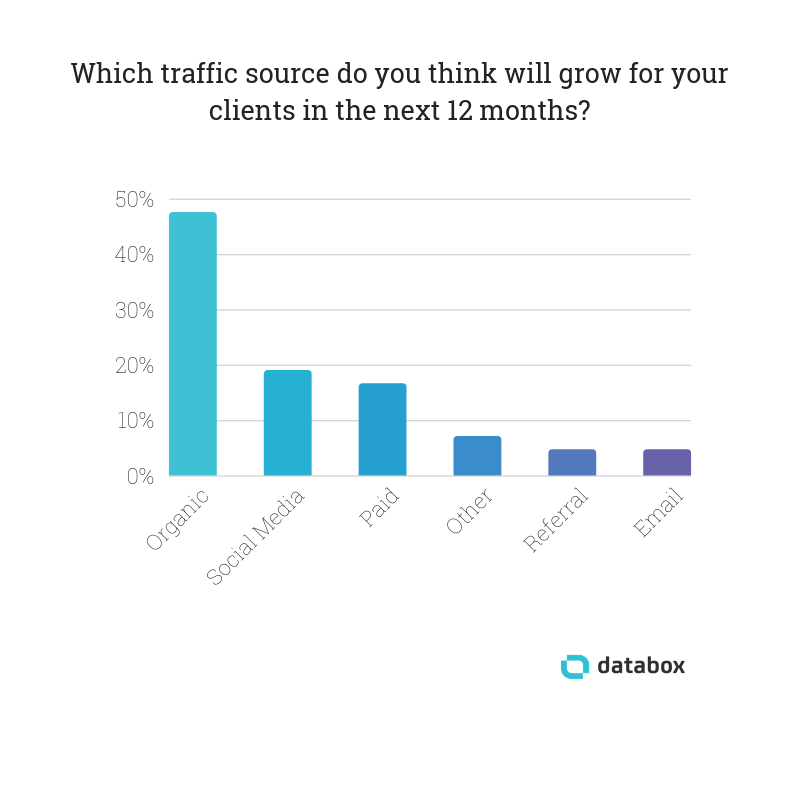 We polled dozens of marketing agencies to find out which traffic sources are working for their clients right now, which ones they see growing, and which they see declining over the next 12 months. Why’d we focus on agencies? Well, it’s simple–they have a much bigger sample to draw their insights from. Not only do they have the experience of their own traffic sources to leverage, but also that of their client portfolio. 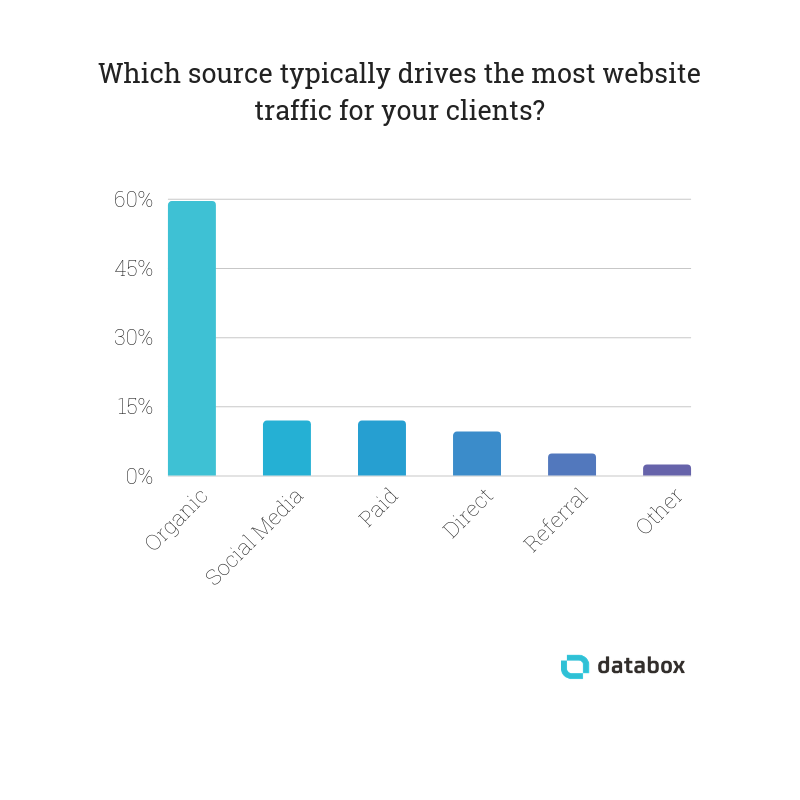 According to our research, 60% of agencies say that organic drives the most website traffic for their clients. Seem obvious? Maybe. But you might not expect the margin by which it dominates the field. The next most common response was social media at 13%—less than a quarter of organic’s popularity. Will organic continue to dominate? Or do agencies see other sources making up a larger proportion of traffic in the next 12 months? Editor’s note: Where do your visitors come from? Are mobile visitors sticking around? Which sites refer the most traffic to your domain? 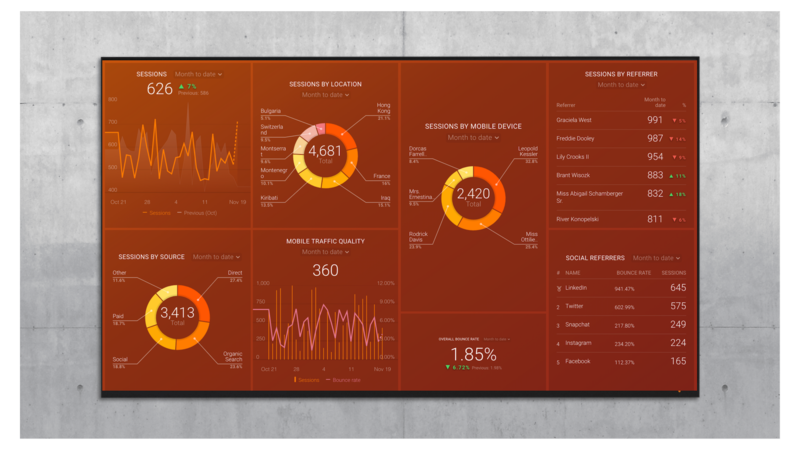 Track and visualize all of that (and more) with this free template. Will Social Grow or Decline? This was the title fight of the survey. Opinions were split over whether organic social and paid social will grow or decline—even though a third of respondents (31%) said that social media was more likely to decline over the next 12 months. 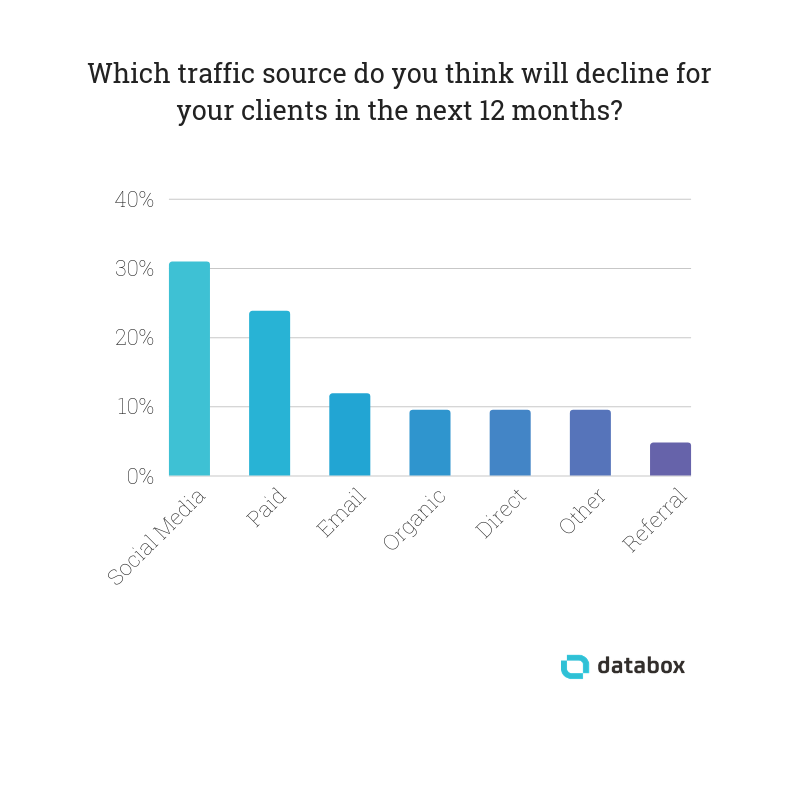 23% said that paid social as a traffic source would decline for clients over the next 12 months. There were some interesting arguments on both sides. Let’s take a look. “Social media is set up to be the next big win on traffic and sales,” says Richard George of Print4Hospitality. But what leads to those successful campaigns and high ROI? “The increasingly sophisticated targeting and reporting functionalities will make targeting specific personas more and more effective,” says Fifth Ring‘s Scott Fraser. Sam Rutherford from SEO Fife pointed out that not all social traffic comes from the traditional giants. Or Will Social Take a Back Seat? Alysa Wax from Precision Marketing points out that company pages on Facebook are seeing decreased organic reach. FullMusculo‘s David de Ponte brought up the decreasing relevance of fan pages. “As social media sites like Linkedin and Facebook move towards more ‘pay to play’ strategies there is a steady decline as it becomes harder to cut through the paid noise,” says Perry Nalevka of Penguin Strategies. Not everyone thought that social would face difficulties in the name of profits, though. Marketers were split about the future of social. Will it shift to a pay-to-play model? Or will increased reliance on social recommendations drive growth? Of course, dark social traffic is difficult or impossible to track. Which further complicates the issue. Most marketers see the most success with organic strategies—and they don’t think that’s going to change. 48% of agencies say they expect organic traffic to continue to grow for their clients over the next 12 months. “Getting visitors from paid search is great but most people still click the organic results, so our aim is to increase organic search presence,” says Sean Morrissy from Flowers Across Sydney. Interesting, one marketer told us that SEO might be on its way out. “We see a decline in SEO traffic in multiple niches due to the fact that Google wants to answer questions within Google instead of referring them to the original source,” says Raul Tiru of GlobalOwls. Tiru wasn’t the only one to bring up voice search. “In the next 12 months, more traffic will come from voice search,” says Jonathan Aufray of Growth Hackers. Some marketers will be relying more on paid search in the coming year. “Paid traffic will continue to grow for our clients even though it is a tiny percentage of their total traffic,” says OverGo Studio‘s Rick Kranz. 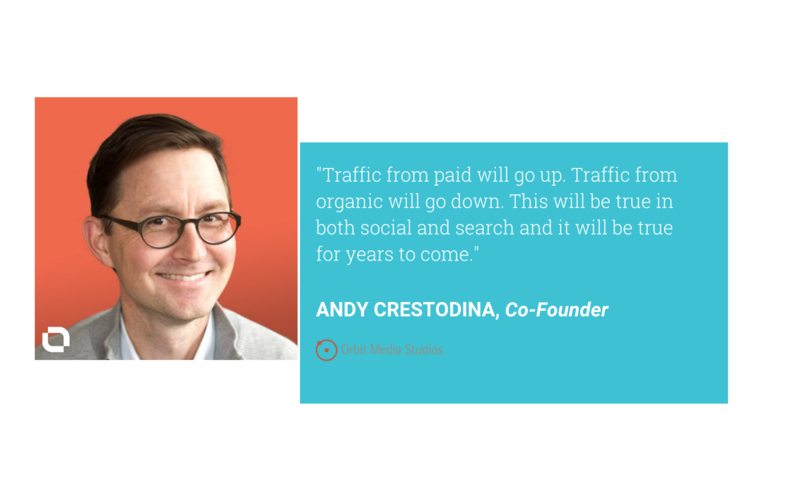 In Orbit Media’s 2018 Annual Blogger Survey, bloggers who paid for traffic were more likely to report strong results than bloggers who focused on organic social, says Andy Crestodina. “It’s because the digital giants (Google and Facebook) make billions of dollars whenever they throttle back organic CTR and increase the prominence of ads.” Crestodina sees this pattern continuing. That being said, companies are always looking to save money. And for that reason, agencies and in-house marketers will always be looking for organic ways to decrease their reliance on paid search. Striking the balance between more effective paid search and a desire to spend less will certainly be a difficult issue for marketers in the coming year. “Overall we expect to see an increase in traffic generated from online video (and mobile video),” says Isabella Federico from Webizz. While there’s no doubt that email is one of the best places to spend your marketing dollars, several marketers think it’s going to go downhill. “I would believe that email traffic would be the leading contender in this department due to more organizations focusing on GDPR-compliance as well as database hygiene,” says Drew Cohen of SmartBug Media. Theresa Keller from Delta Marketing also mentioned GDPR and subscription privacy as an impediment to email marketing. Keller also pointed out that email might be prone to saturation, especially in small markets. “When I think about . 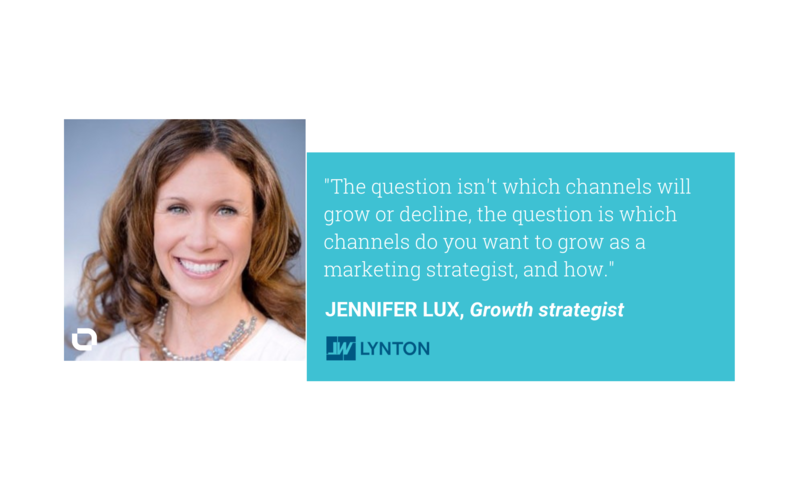 . . ‘what channels do I want to grow over the next 12 months?’ The answer to that question is unique to each client and driven by metrics like customer acquisition costs per channel as well as customer lifetime value per channel,” says Jennifer Lux of LyntonWeb. Every agency, client, and marketing plan is unique. So we want to hear about the channels you think will succeed or dip in the coming year. What do you think you’ll see?